When I first went vegan it was tough. Cutting out the daily meat, eggs, cheese, was a long process, along with other snacks I would casually be eating otherwise (you’d be surprised how they sneak milk into most snacks!). I was that guy who loved his meat, dairy, chocolate, pretty much everything that was non-vegan was my motto. I used to pride myself in eating 5 types of meat at a bbq, literally enjoyed everything non-plant based, I was literally the opposite of what I am today. That was until I had some autoimmune issues and other health concerns, and nothing was working. I did my research and I educated myself and realised how far veganism can take you in terms of health, preventing dis-ease and longevity. But just because one of my main reasons for turning vegan was health, doesn’t mean I don’t crave a nutrition-less snack every once in a while like a chocolate-y biscuit or some savoury crisps. Check out my list of accidentally vegan snacks, simply snacks that are not highlighted for being vegan, but appear to be free of animal products. Growing up to the common culture of going school, then going to the shops pretty much every day to get a little snack after, got me in the habit of finding the bargains. 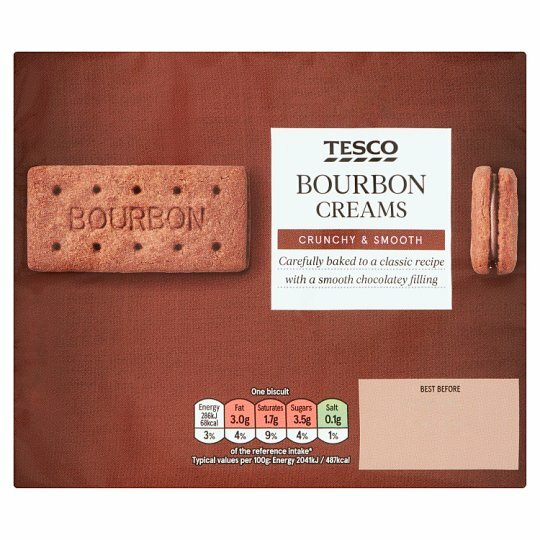 These babies are less than a pound, and personally I’ve always preferred them to custard creams! I know what you’re thinking: Roast Chicken + Crisps = You’re chatting rubbish; I kid you not, upon checking the ingredients myself I was pleasantly surprised to see the “roast chicken seasoning” is made up of: salt, garlic, yeast, onion, parsley and paprika, literally just seasoning! What’s more, this isn’t just applicable for the Roast Chicken flavour, but also for other “meaty” favourites such as “Smoky Bacon” and “Prawn Cocktail” are also free of animal products as cited in the ingredients. Unfortunately not all Walker’s crisps flavours are vegan, for instance the cheesy ones have whey and cheese powder, stuff you want to avoid if you want to become vegan! One of my favourite snacks, so simple, so tasy, has no hidden “beef” or “chicken” flavouring, no questionable ingredients, just chickpea flour, lentils, split peas and spices! 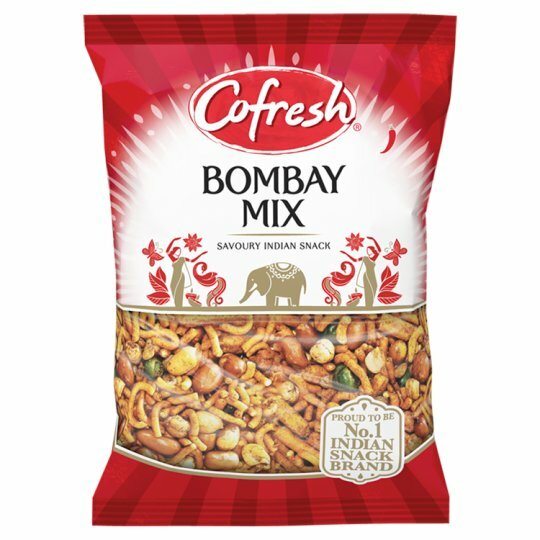 It is actually also surprisingly high in protein, with 13g every half-pack, but careful as it is also piling 2.24g of salt for the same quantity, but a great vegan snack to know of from the top of your head! I was so disappointed when I first went vegan and wanted to avoid milk and eggs altogether, when I found out that my second fave flavour (Cool original) has dairy in it. I ended up not buying Doritos for quite a while, but then after a while I was in the snack isle and decided to have a look at Chilli Heatwave Doritos, check their ingredients and voila! It’s vegan! With no animal products contained in this flavour Doritos, you can snack safely and soundly knowing it’s cruelty-free. The word “bacon” may throw people off, or even attract certain people, but for pork avoiders, meat lovers and vegans alike, we can all enjoy this snack with a clear conscience as it is completely free of animal products! The “smoky” bacon type flavour appears to be made by smoke flavouring, which is rather popular nowadays in vegan cooking so it does make sense! Personally I wouldn’t go out of my way to buy this specific snack but all to their own. Chocolatey cereals were my favourite, but taking veganism seriously I had to cut out dairy to truly feel the effects, which meant I should avoid the majority of chocolate cereals. I was very surprised when I saw that these shreddies were actually completely vegan, next time you feel like a bowl of cereal, go grab some Coco Shreddies and your favourite dairy-free milk. With any snack nowadays that has a glaze, it does make me gaze and wander: hmm… Has that got egg or milk in it at all? So as you do, I’m browsing the supermarket and I check these, which I used to eat out of curiosity and was blessed to see that they don’t have any animal products listed in the ingredients, happy days! Skittles, despite having numerous colourings and questionable ingredients, is a solution to those who want a chewy sweet free of gelatin and animal products! Take this with a pinch of salt however, I’m iffy with food colouring ingredients as there are some sourced from insects or whatnot, so always double check if you have a feeling. 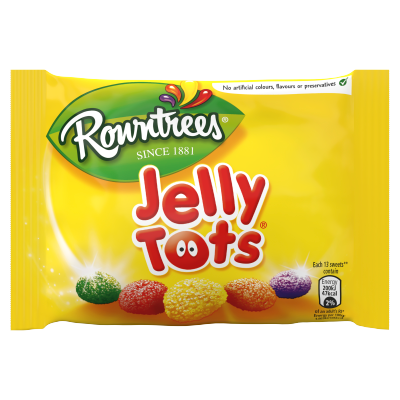 Even though they’re chewy, even though they’re jelly-ey, they’re vegan! Made from fruit extracts and sugars, etc, these fizzy, fruity bites will satisfy your sweet tooth every once in a while. Another fizzy sweet to add to the list. Haribos don’t quite have the reputation to cater t vegetarians, let alone vegans. But there they are, vegan rainbow strips, so you know where to go for that next sweet pit stop. 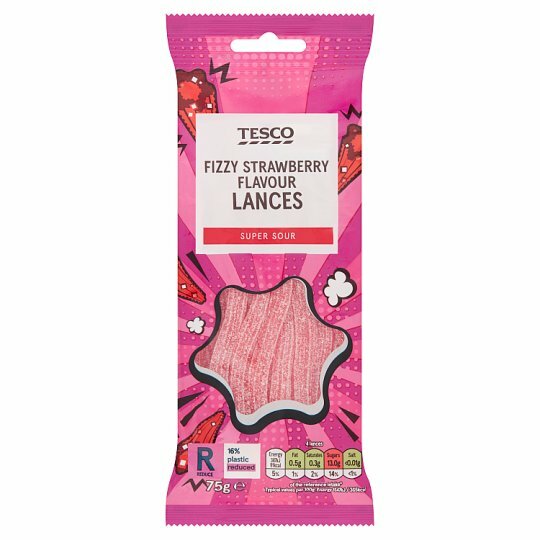 These have got to be the most satisfying, yet cheap fizzy strawberries gummy sweets that I’ve ever tried, AND they’re cruelty-free! They’re literally like 40p at Tesco; one of my essentials when chopping for movie snacks. The Nature Valley range overall is pretty good, but as I changed my diet I noticed quite a few do have creamy-ish bottoms which contain dairy and egg, also some bars contain honey, which is also not vegan friendly. But the good news is these dark chocolate flavour Nature Valley bars are the BEST flavour and contain no dairy, making them an awesome vegan snack you may not know about. Although it’s another one on the list that says “chicken” on it, on the website itself it says that this is suitable for vegetarians, and the list of ingredients doesn’t seem to show any traces of egg or milk, or more importantly CHICKEN. So for those who prefer a bowl of rice when the hunger strikes, this easy option should be perfect for you! Contrary to popular belief, and decades of marketing linking this product with milk, the cookie itself is free of all dairy and other animal products. Not to say it’s healthy, as it’s not, (it is still junk food and made with numerous oils and syrups) but it is a good snack for when you feel like a tall glass of (oat) milk with some cookies on occasion, either Oreos or Bourbon Biscuits do it for me! 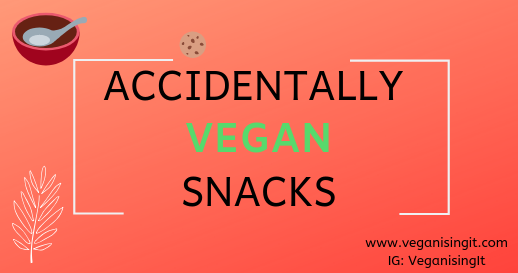 Those were some accidentally vegan snacks that you may or may not have known were vegan! If I missed any you feel is worth noting please leave a comment, I look forward to starting this journey into veganising it for the better!